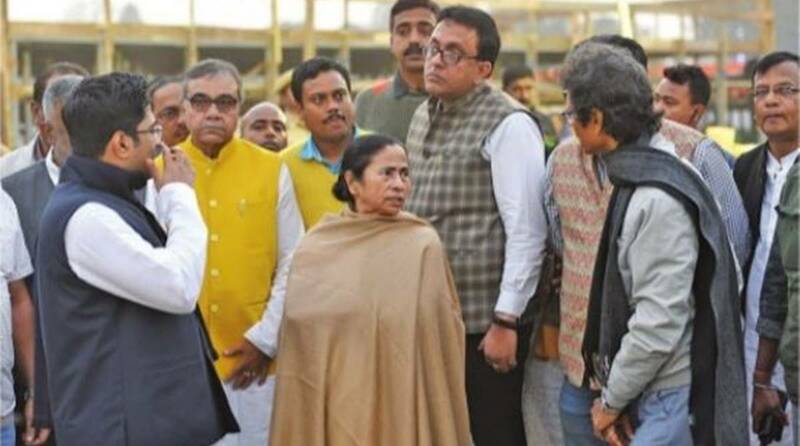 West Bengal Chief Minister Mamata Banerjee said on Thursday the mega Opposition rally being hosted by her Trinamul Congress in Kolkata on 19 January would sound the “death knell” for the BJP in the Lok Sabha polls and regional parties would be the deciding factor. She also claimed that the BJP’s seat count in the general election would not cross 125. The number of seats that the state parties would win would be much more than the BJP’s, she further claimed. “I won’t be able to predict right now how many seats the Congress will get in the general election but the BJP will not be able to cross 125 seats,” she said during her visit to the Brigade Parade Ground on Thursday. She visited the spot to see the arrangements for the 19 January rally where leaders of different regional and national parties would meet. “Such a major meeting of Opposition parties has not happened in recent times,” she told reporters on Thursday. “After 41 years, we are having such a large-scale mass congregation where leaders from Jammu and Kashmir to Kanyakumari, UP, Bihar and other states will participate. In 1977, my predecessor, Jyoti Basu tried to unite Opposition leaders but that was not on such a grand scale. I have also extended an invitation to the CPI-M leader and Kerala chief minister P Vijayan to the 19 January Brigade rally. Though Mr Vijayan attended the Opposition’s meet in Delhi, he is yet to reply to her invitation. She said one such Opposition unity move was also initiated by Jai Prakash Narayan against the then Prime Minister Indira Gandhi. She said today BSP general secretary and Rajya Sabha MP Satish Chandra Mishra has confirmed that he would attend the 19 January Brigade meeting. Earlier, she had a telephone conversation with Samajwadi Party (SP) chief Akhilesh Yadav and said that he had assured her of his presence at the rally.”Soniaji is sick, so she has deputed Mallikarjun Kharge, Congress leader in the Lok Sabha as her representative,” she said. Moreover, Abhishek Manu Singhvi, Rajya Sabha MP from West Bengal, will also attend the meeting. She said the former Prime Minister Mr H D Deve Gowda, present Karnataka chief minister H D Kumaraswamy of the Janata Dal (Secular), Telugu Desam Party (TDP) supremo and chief minister of Andhra Pradesh, Chandra Babu Naidu, the Aam Aadmi Party (AAP) leader and Delhi chief minister Arvind Kejriwal, the Nationalist Congress Party (NCP) leader Sharad Pawar, Farooq Abdullah and Omar Abdullah of the National Conference (NC) and M K Stalin from the Dravida Munnetra Kazhagam (DMK) will be present at the Brigade Parade Ground rally. The RJD leader Tejashwi Yadav and BJP MPs ~ Shatrughan Sinha, Yashwant Sinha and Arun Shourie are likely to attend the mega Opposition rally. She visited the venue of the rally to check arrangements. Asked whether the rally would be like the one she held in 1992 against the then ruling Left Front in West Bengal, Banerjee said, “I was then a leader of the state Youth Congress. But now there will be various Opposition leaders who will be attending the rally. I don’t want to say anything, let them (Opposition leaders) say. I want to hear them. Everything will be based on consensus,” she added. Asked to comment on BSP supremo Mayawati not attending the rally, she said the party’s senior leader Satish Chandra Mishra will be here. “This is a big thing for us,” she said. “I have come here to look at the security arrangements as so many former and present chief ministers, former Prime Minister and several important leaders will be attending the rally. We are all waiting for them,” she said. Banerjee said a tea party has been arranged for the guests at the Shoujanya state guest house in Alipore. There the dignitaries will decide their plan of action for the upcoming Lok Sabha polls and later hold a press conference. In all, five stages are being constructed for the rally. The main stage where the national dignitaries will be present is flanked by four other small ones, two on each side to accommodate the party’s MLAs, ministers, councillors, district presidents and one meant for people from the cultural and sports world. LED projectors will be placed at the Brigade Parade Ground and also at important crossings like Esplanade, Park Street, Red Road. Rest room for the dignitaries has been set up behind the main stage. The Kolkata Police is entrusted with the security of the entire programme and drones will be deployed for aerial surveillance of the mega Opposition rally.